FRUSTRATED searching for cables under your desk or behind your nightstand? Not anymore! PERFECT GIFT: Arrives in a premium gift box packaging as shown in photo and comes bundled with 4 bonus reusable cable ties. 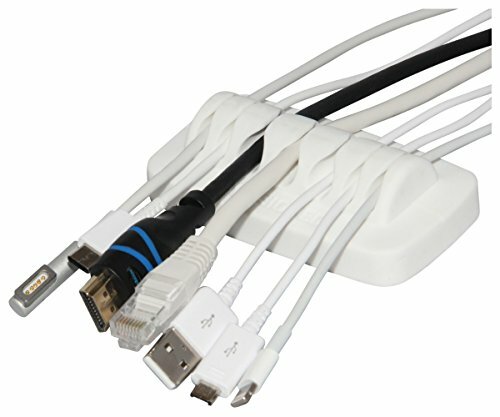 PATENT PENDING: Supports small and large cables, including Apple lightning cables, USB, HDMI and network cables. Compact design maximizes your desk space (measures 3 5/8" x 2" x 1"). HEAVY WEIGHTED NON-SLIP BASE weighs over half a pound! Keeps cables from slipping away without the need of adhesive tape. ECO-FRIENDLY - NON-TOXIC - NO BAD SMELL! Original and only model of this design and weight, manufactured with quality FDA food grade silicone. GUARANTEE: Try it risk free. If you are not happy in any way, simply return it for a full refund.